Summer grilling season! We love to spend time on our decks cooking meals, consequently keeping the kitchen cool during the warmer months. If you are looking for a quality reliable gas grill, look no further than the offerings below. 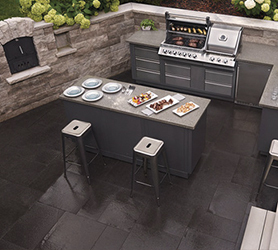 These grills can be built into an outdoor kitchen, or attached to portable bases. If you feed lots of hungry folks at one time, consider grilling with infrared – TEC grills use gas-fired infrared heat to seal in moisture and cook quickly, producing a delicious product! 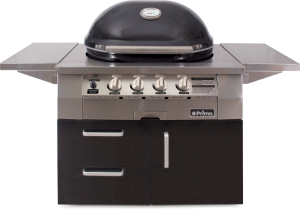 The Primo Gas Grill shown here is the next revolution in outdoor cooking, offering you all the advantages of charcoal grilling such as two-zone cooking and the ability to grill, bake, roast and smoke. The Primo Oval G 420 goes one step further and offers the convenience of gas. A family-owned and operated local business, Mountain Home Stove & Fireplace has been keeping the Yampa Valley warm and happy since 2002. Our mission is to be the Steamboat Springs area’s go-to resource for safe, quality products and services, with a personal touch.